The lead article in this issue concerns the remarkable artist, Bryan Charnley. Bryan suffered with mental health problems for many years, was diagnosed and treated for schizophrenia, decided to stop taking his meds, and finally took his own life. The article includes images and writings he produced when he had stopped his meds and descended into his own nightmare world. 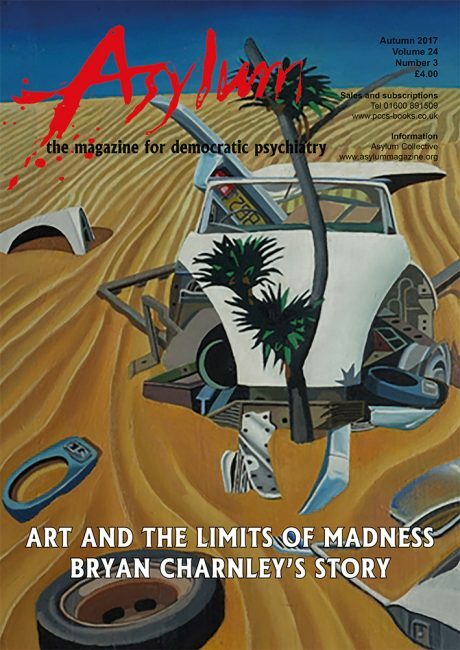 Although some readers might find the story distressing, we have included it as the main feature because it raises a number of very difficult questions: for example, about people’s right to go mad, to take or not take meds, and their right to pursue a dangerous path which might end in suicide. Co-authored by the artist’s twin brother, this article offers no easy answers. As always, we welcome thoughts and reflections on the important questions raised. This issue also explores the democratising potential of therapeutic communities and one person’s complex relationship with legal capacity. It reflects on the impacts of a diagnosis on physical health and critiques the psychiatric interview. Two events are introduced – one in memory of Robert Dellar – and there are some thought provoking cartoons and illustrations, powerful creative writing and news items.
. . . to all who contributed to the success of June’s Asylum conference in Manchester – to everyone who participated, but of course especially to those who helped with all the organising. Special thanks must go to Ian Parker and Helen Spandler of the Asylum collective for their commitment to the project in the face of so many difficulties, and Alex Dunedin from the Ragged University for fundraising and hosting our superb evening celebration. We’d also like to thank Di English and others at PCCS books for dealing with bookings and general liaison; the many helpers on the day (too many to list! ); and those who donated to our crowdfunding campaign. We know that some of the presentations sparked a lot of debate and we very much welcome further discussion in the pages of the magazine. We hope to produce a special issue soon featuring some contributions and reflections. My name is Leslie Sarkozi and was the Chair of Sagacity In Community Care(SICC) in Ealing in the 80s. As some of your founding members may remember me and the papers I wrote then. Do you still have any of these papers in your archives? If so could you email me them and publish them in future editions as they are even more relevant to the present state of inpatient/outpatient care, service delivery, user involvement, housing, benefits , and Community Care. Regards Leslie.